I'm honoured and delighted to be able to tell you that Titti Malmberg and I are featured as 'Blogger of the Month' in the latest issue of the Swedish magazine Lantliv. 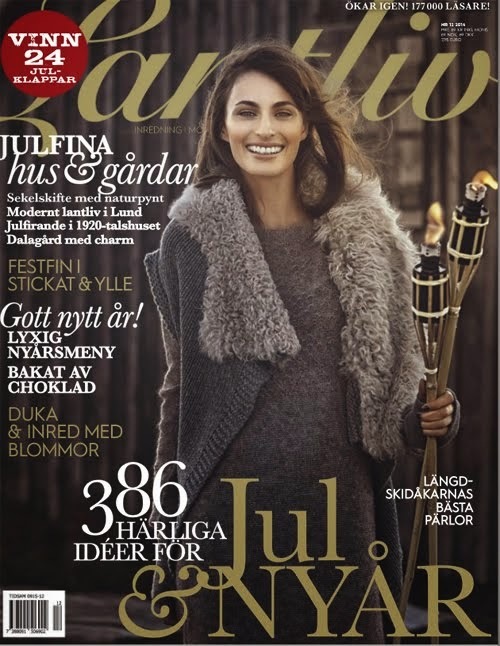 Lantliv means country living and it's a great magazine that's regularly published twelve times a year. They also publish a few special editions every year - about gardening, summer living and Christmas. It has lovely features on interiors, food, gardening, fashion, beauty and travel. It's has a mix of charming country living with modern Scandinavian design. Every month Lantliv do a little write-up about bloggers with a picture and this month our blogs are featured. "Ingrid Henningsson lives in an Arts and Crafts house built in 1911 in London with her husband and two children. Ingrid has a background as a photographer, garden designer and teacher in horticulture. On her blog Of Spring and Summer she is styling, photographing and writing about flowers and floral styling. Titti Malmberg lives in an old house built in 1929 on the island of Öland with her family and her old cat Sötnos. Titti is a freelance lifestyle and flower photographer and has worked for many years as a stylist. 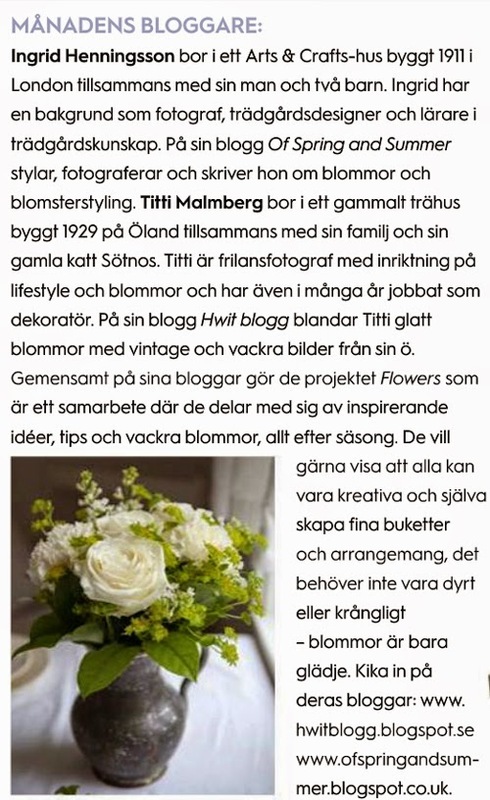 On her blogg HWIT BLOGG Titti is happily mixing flowers and vintage with beautiful images of her island. Together they collaborate on their blogs with a project called FLOWERS where they share inspiring ideas, tips and beautiful flowers all according to the seasons. They like to show that everyone can be creative and make arrangements themselves and that it doesn't have to be expensive or difficult - flowers should be a joy!" Here is a link to Titti's blog - HWIT BLOGG. Have a Lovely and Creative Floral Day! Ingrid, how wonderful that you and dear Titti are having your splendid blogs featued in such a fine magazine. I will have to inquire at Barnes & Noble to find out if Lantliv is amongst the many international magazines that they carry. Meanwhile...congratulations. How wonderful that many more new readers will discover what we already know...how creative and generous you and Titti are. Congratulations Ingrid. I sent the link for your favourite design books out to a number of women who have added a few of the titles to their Christmas list. I hope they'll visit your blog often for inspiration. Unfortunately none of them are bloggers. Oh !! toutes mes sincères félicitations ! C'est formidable et tellement mérité ! Une année 2014 qui s'achève dans la joie et les honneurs. Je me réjouis pour vous. je suis toujours heureuse de ce qui peut arriver de formidable autour de moi, cela prouve que la vie est belle. Je vous souhaite un très magnifique mois de décembre et à l'aube des fêtes tout plein de bonnes choses pour vous et ceux que vous aimez. Så morsomt da, gratulerer som månedens blogger. Følger både deg og Titti. Masse inspirasjon å hente hos dere begge, så jeg skjønner godt at du har blitt valgt ut som månedens blogger. Congratulations on you and Titti's being mentioned in the magazine. You both deserve it, having beautiful and inspirational blogs! What a lovely way to start Christmas with such good news. Ingrid, congratulation!! Bloggs Titti and Ingrid - Best! !